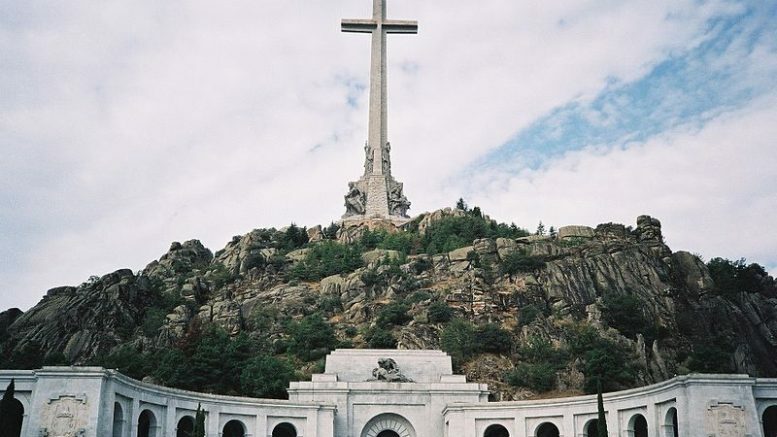 All opposition parties in Spain’s Congress signed onto a non-binding resolution proposed by the Socialist party (PSOE) last week calling for the government of conservative Partido Popular (PP) President Mariano Rajoy to begin a process of removing the remains of Gen. Francisco Franco from the controversial “Valley of the Fallen” mausoleum located in the Guadarrama mountains outside Madrid. The former dictator, who ruled Spain with an iron first for nearly 37 year years following the bloody 1936-39 Spanish Civil War, is buried alongside the altar in the Catholic basilica at the center of the vast mausoleum site. Franco’s remains lie opposite the altar from those of the founder of Spain’s fascist Falange party, José Antonio Primo de Rivera, who was instrumental in encouraging the 1936 military uprising that sparked the Civil War, from which Franco-led forces emerged victorious after defeating forces loyal to the democratically elected Republican government. The non-binding resolution, passed by a vote of 198-1 and over the abstention of 140 PP deputies, urges the current PP government begin the thorny process of negotiating the terms of the removal of Franco’s remains from the basilica with the former dictator’s family and the superiors of the Benedictine religious order that administers the basilica itself. The Catholic religious order and the families would have to agree to the removal of the remains of the dictator and falangista leader to other sites. The PP has already indicated it will not act in the matter, because it believes there is not sufficient national consensus to do so. But the non-binding resolution does set out 16 measures the government could take immediately to begin reconverting the massive mausoleum location from what is clearly seen by Franco loyalists and the site’s detractors as a monument to the Franco regime into a memorial of national reconciliation and “collective democratic memory” that provides some dignity for the thousands of civilians and soldiers loyal to the Republic who are buried there alongside the victors. The mausoleum complex, built during the Franco dictatorship that followed the war with the forced labour of defeated Republican soldiers and civilian supporters of the Republic under conditions widely acknowledged to have been brutal and inhumane, contains the remains of an estimated 33,832 dead from both sides in the Civil War — including thousands of Republicans whose remains are mixed in with those who they fought against and by whom they were killed.